East Market – Vintage, wine, food and music! I must confess I love markets in all their shapes and colors, especially when they are vintage! I am fascinated by the idea that a bag or chair have had previous owners and multiple histories behind them… The East Market is a marketplace where private vendors sell to the public. You can buy, sell or swap whatever you want! The prices are fairly low and you can find just about anything from a Prada dress to an H&M sweater. Every edition usually hosts circa 100 different stands where you can find bags, clothes, collectors items, sunglasses, and unique furniture. If you get hungry while you shop, no need to worry as the East Market also has a dedicated area for food trucks where you can eat amazing burgers, vegetarian dishes and of course drink wine or beer for cheap! If this doesn’t already sound good enough, I forgot to mention that they always have great DJs playing. 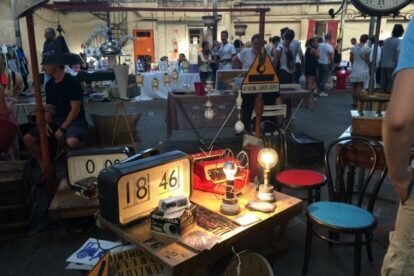 As vendors start to leave around 20:30 and the market closes at 21:00 it is a perfect place to come for aperitivo to have a drink with friends and shop around. As this market is fairly new the scheduled dates and hours tend to vary so the best way to be updated is to follow their FB or Instagram.